Drs. Neil J. Zemmel and Steven J. Montante of Richmond Aesthetic Surgery recently worked with our team at Rosemont Media for the development of their new specialty plastic surgery website design. Created as an interactive patient resource on facial plastic surgery, the new site has been equipped with innovative design elements to enrich the patient viewing experience. This includes responsive capabilities that cause the site to automatically resize to fit the dimensions of the user’s Internet device. Another advanced feature incorporated into the website is the fixed video background, which plays a continuous video behind the homepage content for a more dynamic viewing experience. Other visual areas of the website include clickable images on the homepage that direct to their respective facial procedure pages, as well as the facial concerns page, which displays a face model that allows the viewer to click on their problem area to learn about their treatment options. The entire facial plastic surgery website has been enhanced with leading medical SEO strategies to improve the practice’s visibility online. With this optimization, people searching for information about facial procedures can more easily find the comprehensive resource provided by Drs. Zemmel and Montante. 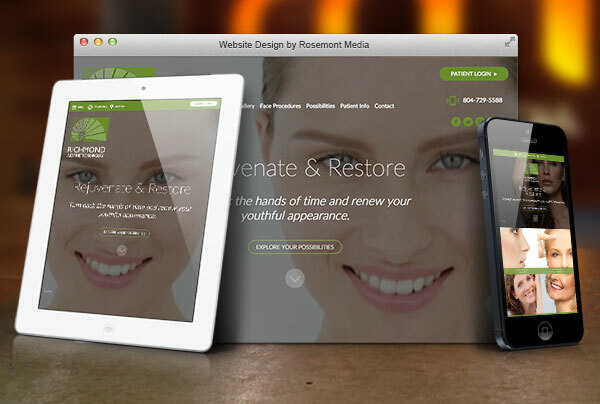 To get an idea of what Rosemont Media can design for your plastic surgery website, please visit richmondfacelift.com.